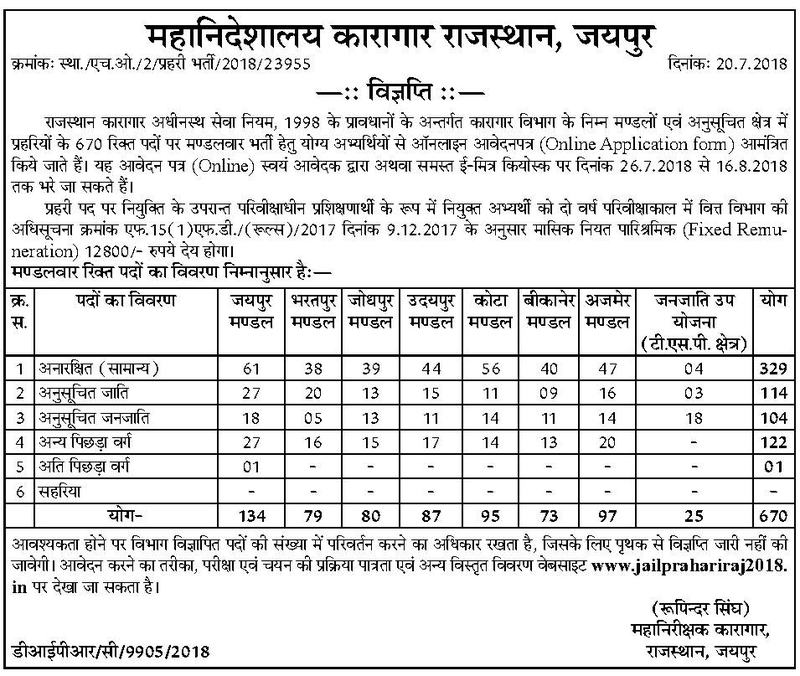 Rajasthan Jail Warder 670 Govt Jobs Recruitment Notification 2018-Apply Online, Syllabus Physical Tests Details- www.jailprahariraj2018.in, Rajasthan Jail Warder Recruitment Notification 2018, Physical Test Details, Syllabus for 670 Govt Jobs-Apply Online- www.jailprahariraj2018.in, Government jobs in Rajasthan Jail Warder Recruitment Exam Syllabus Notification 2018-Apply Online @www.jailprahariraj2018.in. and TSP Area. There are total 670 posts in this Rajasthan Prisons/Jail Warder vacancy recruitment. Online applications for these Rajasthan Jail Warder jobs will be available from 27-07-2018 to 16-08-2018. Official website to apply online for these Rajasthan Jail Warder Posts are is www.jailprahariraj2018.in. Candidates selection for this Rajasthan Jail Warder recruitment 2018 will be based on Written Exam, physical standards tests, physical efficiency tests and documents verification. Rajasthan Jail Warder vacancy Written Exam Pattern, Written Exam Syllabus, Physical Tests details, age limits, qualification, salary, How to apply online and other details for this Rajasthan Jail Warder Recruitment 2018 Notification is given below. Government jobs in Rajasthan Jail Warder Recruitment Exam Syllabus Notification 2018-Apply Online @www.jailprahariraj2018.in. 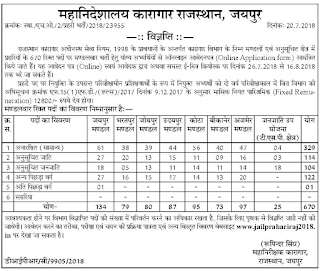 There are total 670 Warder posts in this Rajasthan Jail Department recruitment 2018. Candidates must have qualified 10th class for applying these Warder posts. Selected candidate will received monthly Rs.12800/-. Age limits are 18-40 years for general candidates and for other age relaxation is applicable as per the government norms. Candidates selection is based on written exam marks merit, physical standards tests, physical efficiency tests and documents verification followed by medical tests. Written Exam will be conducted for 400 Marks. Exam duration is two hours. Total 100 questions will be given and each question carries four marks. For each wrong answer one mark will be deducted. Download Exam Pattern and Syllabus here for Raj Jail Warder Posts in pdf format.. Interested and physical fitness having candidates can apply online for these Jail Warder jobs through official website of www.jailprahariraj2018.in. Last date to submission of application form online is 16-08-2018. Exam Pattern, Exam Syllabus, admit card release date, physical tests details and exam result and other details are available in this website only.